After Geneva, I was off again via the train this time heading towards the other end of Lake Geneve towards another village popular within my Facebook survey. 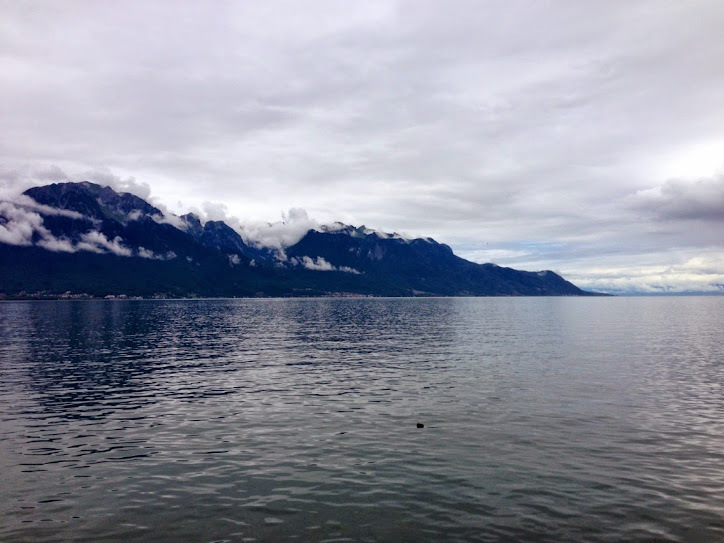 I could see why on arrival that more than one of my friends felt Montreux was their favourite place in Switzerland. I could have stayed in Montreux quite happily. There were a few things I wanted to do like the chocolate train and a couple of interesting sounding museums. But I had a friend to meet in Zurich and time was marching on. After a quick wander through the castle (Château de Chillon) and lakeside stroll, I was back on the train and hurtling through the Alps towards the North. On arriving it was great to meet up with a Swiss friend that I’d originally met in Budapest. But I have to admit I didn’t find Zurich as appealing or beautiful as Geneva and Montreux. It might have been because the weather was terrible with overcast skies and drizzle. But I also felt like there were fewer attractions that appealed to me. The food was delicious though. Sara introduced me to her favourite vegetarian restaurant called Tibits. Which. Was. AMAZING. It was one of those buffet style places where you pay by the weight of your plate. It’s very difficult to avoid over-loading up your plate as everything looks mouth-watering. I’m happy to say that there is a Tibits in London so don’t worry if Zurich isn’t on your to visit list for a while. There is hope! So where’s my food huh?? I thought it was interesting how only swan-related photos survived but hey who knows with my camera. Maybe it’s just really really into swans. And with that my Switzerland trip was over. I was away for just four beautiful nights. I did time my return flight back to be late in the day so that way I could explore Zurich some more. But I hadn’t banked on bad weather which resulted in me sulking through a museum before hiding back at my hostel in the dry warmth. Overall: I liked this hostel more than my Geneva one. It had a warmer and friendlier environment as well as being quite modern. There was a music band playing in the hang out area when I arrived and a bar for hostel guests. The beds were super comfortable. I would almost just stay at this hostel again for the sleep quality alone. Almost a month ago, I had a good chunk of days off thanks to the way the rotating roster system works in nursing. I did some shifts right at the beginning of two week, and then had the shifts for the second week placed at the end of the fortnight giving me a sweet six days off in a row. So of course I had to go somewhere in Europe. I flew into Geneva as my starting point of my trip. My Facebook survey showed the majority of my friends liked this place the most out of Switzerland. And I could see why. It was absolutely stunning. Did I mention there were swans.. There wasn’t a huge amount of stuff to do as such in Geneva. But it is just one of those places that is so beautiful, that you don’t mind wandering around with your mouth open and camera snapping. I did enjoy spending a few hours in the sun at Bain de Paquis which is a man-made beach with a lighthouse, knitting, cheap food and spa baths in the middle of the lake. It’s where the locals tend to go on the weekends and is cheap entry at a mere two swiss francs. The atmosphere with laughter and people playing on the diving boards and water-based volleyball court is quite enjoyable. At night-time I was lucky enough to be in Geneva during their summer musical festival. It was very pleasant sipping on a hot drink and listening to Joyce Jonathan croon away in French. Overall: It is part of the Hostel International network which means if you aren’t a member, then you have to pay an extra fee on top of your nightly rate. Luckily I am an HI member. I really liked it although the hostel itself was a bit too big and busy for my taste. But it was modern and clean with comfortable beds. The lockers were outside the rooms which I quite liked as it meant the dorm rooms were kept quite uncluttered. Location is great with being close to the lake and the main train station.